If you are looking for supreme quality Germany Football Accessories then you are in the right place. During the build-up and throughout every European Championship and World Cup, football fever grips the world therefore the demand for souvenirs and merchandise grows astronomically. Therefore, if you are contemplating placing an order with us today, we highly recommend you do so before it is too late! As one of the most successful national team’s, the demand for Germany national team soccer merchandise is high. So here at Soccer Box we stock a range of German football gear which are perfect for a range of supporters. Take a look at the products we have available and start shopping for the next international tournament here! Making sure that supporters can rep their national crest with ease over the years, all of the accessories and apparel keep to a similar colour scheme. 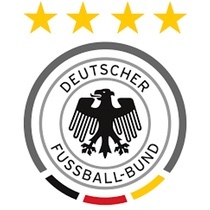 Therefore, when Adidas launches a new home shirt for an upcoming tournament you can be sure that the rest of the Germany merchandise will follow in suit when it comes to the design. However, the most consistent part of this manufacturing process is that the colour scheme always remains as monochrome. As a result of this you can don a range of souvenirs for more than one season or purchase previous year’s products for a lower price and still remain relevant with the current attire. This is the perfect choice for shoppers on a budget or those who love collecting authentic sports souvenirs produced by the long term producers – Adidas. Beanies and caps both serve the same purpose when it comes to the basics of the accessory. Both of these hats ensure that your head remains comfortable whether it be warmer in the winter or cooler in the summer. And the Germany cap also includes a peak at the front to protect your face from harsh rays. Therefore, you can invest in the most excellent gift for your loved one today by ordering the knitted hat and baseball cap as together! Enabling them to show off their allegiance for the German national team no matter the weather, these will be their favourite essentials. Adding to your show of support during winter fixtures, you can also get a Germany football scarf adorned with the national team’s branding. Supplied in a number of designs, you are able to have the option to discover which pattern and styling suits you or your loved one more. Each of these scarves has the same appearance on either side which makes them perfect for hanging in your room or holding up at international fixtures. Perfect for carrying your school supplies or gear for a long journey, a backpack would be the go-to choice. This is because it has a number of compartments to store your belongings in and is much larger than the other bags we stock. Along with this, the rucksack has zip fastenings for security and padded straps for comfort. For your gym kit or essentials you need access to frequently, the Germany gym sack would be more appropriate. This is because the bag is much lighter and fastens with a drawstring to increase accessibility. Also we have a shoe bag available too. This type of bag is excellent for keeping dirty boots away from the rest of your sportswear so would go superbly with the sack. Lastly, to help you improve your soccer skills at home or at the training ground you can order a ball emblazoned with the DFB crest. Stocked in a size 5 this football is a popular choice as the size is the match standard used by professional players. Therefore this size is suggested for teens to adults and as the ball is delivered deflated you would need to pump it up before playing. So whether you are after the perfect accessory to your match-day look or just want to refresh your essentials, you are guaranteed to find what you are after here. Don’t forget that before you head to the checkout you can also take a look at our collection of genuine replica Germany sportswear too and build an outstanding outfit to go with your new souvenirs. As we often reduce the price of previous tournament’s clothing ranges, you can keep your eyes out for some fabulous bargains too! You can also take advantage of our vast selection of shipping services. As Germany is one of the most successful national teams in the world, it is understandable that their fan base spreads across the globe. So to ensure that supporters worldwide can shop their favourite squads gear, we offer a fantastic number of international express and UK delivery options. We also have a newsletter which you can sign up for today and be notified whenever there are any new kit or merchandise launches. Along with this you can receive unique coupon codes and pre-sale access before anyone. And yes, you get this all for free direct to your email inbox, so why not join our VIP group now! ?